Los Angeles has won the INRIX Traffic Scorecard award as the most gridlocked city on the entire planet! This is given out by the transportation analytics company INRIX, which tracks many drivers. This is reported on by Katie Pyzyk on Feb. 7, 2018 in the SmartCities DIVE. Going directly to the INRIX Traffic Scorecard, they estimate that the direct and indirect costs of congestion in the US alone amount to nearly $300 billion in 2016, or $1,400 per driver on average, while US drivers spent an average of 42 hours in congestion last year, or 9% of their driving time. Los Angeles drivers spent 102 hours in peak traffic in 2016. Close runners up were Moscow with 91, and Sao Paolo with 86. Then came San Francisco with 79, Bogota with 75, London with 74, Atlanta with 70, Paris with 69, and Miami with 64. In fact, 10 of the top 25 global winners are in the United States. The Southern California Association of Governments has a Regional Transportation Plan/ Sustainable Communities Strategy at scagrtpscs.net for 2016-2040. If you think in terms of commuting 50 weeks a year, that is two hours of frustration per week. For 40 working hours, that is suffering 5% of working time during your commutes. You are also spending this time with stop-and-go inefficient trucks and SUVs packed as tightly as possible. The smog enhancement factor must be enormous, and this occurs every workday. Probably, we have the cleanest cars with smog equipment and required biennial inspections, and special clean fuels. Ms. Pyzyk points out that customers do not visit businesses if they are going to be caught in heavy traffic. You can add to this difficulties in visiting relatives and friends. The per driver cost in each of these top cities of course beats the average US per driver cost of $1,400. Number 10 in the US is Seattle. They spent 55 hours in congestion, with 12.6% of drive time, for an average driver cost of $1,590, and a total cost of $2.0 billion. The average speed on streets in LA was 11.07 mph, in SF 11.54 mph, and in New York, 8.23 mph. For even smaller cities, with not too much congestion, the total cost can still mount up. I must tame your ecstatic celebrations by pointing out that we lost the Tom-Tom Tracking Index competition, which only placed LA as number 12, with a 45% congestion level, and with Mexico City taking first place with a 66% congestion level. Ten of the top 25 cities are in China. However, Los Angeles again is first in the US, followed by number 30, San Francisco, with a 39% congestion level. New York was third in the US but number 49th overall, with a 35% congestion level. Seattle was 53rd, with a 34% level, and a surprise winner, at number 65, was San Jose with a 32% level. 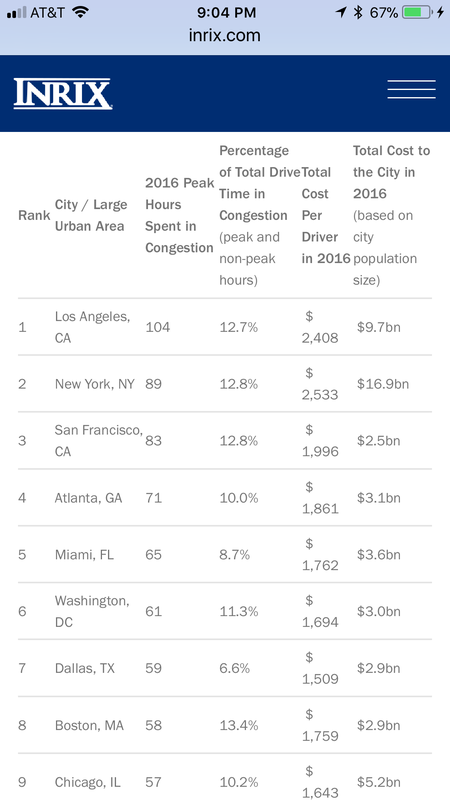 Finally, Miami at number 75 and 30% congestion, and Portland at number 82, with 29% congestion. Honolulu and Washington D.C. were 89 and 90th, tied at 29%. Boston has 28% congestion, and San Diego and Atlanta have 27%. Just focusing on California now, Sacramento and Riverside come in at 22%. Fresno has 19%, and Bakersfield 18%. Notice, we are now below half of Los Angeles’s 45%. Irvine did not make the list, which ended at 9% congestion. This reminds me of a story. UC Irvine Nobel Laureate, chemist Sherry Rowland, and UCI chemist Donald R. Blake, examined air samples from Mexico City. They found major pollution from leaks from propane gas cylinders, which were used for cooking. The hoses linked up to them were leaking. This shows the importance of using our scientific capabilities and excellence in helping countries around the world meeting their challenges. This requires dedicated government funding for this purpose. This entry was posted in Air Quality, Autos, California Smog, Equivalent Electric Car Emissions, Los Angeles Congested Traffic, Smog worldwide, World Smog. Bookmark the permalink.